In the historic town of Koggala, you will find the tranquil oasis of the imposing Fortress Hotel, where modern design meets historic Dutch and Portuguese style. 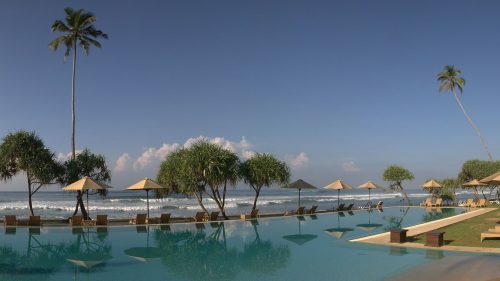 With a number of guest rooms and villas, each furnished with wooden accents and artisanal Sri Lankan touches, guests can relax in stylish, accommodation, with modern amenities whilst enjoying the resort's take on local history. Choose to dine in one of three excellent restaurants serving everything from traditional Sri Lankan cuisine to Greek and Lebanese dishes. For a romantic evening visit Duo, where a selection of over 2000 wines, both old and new, perfectly complement a range of meals. Try something new at the T-Lounge, where guests can experience a traditional tea making ceremony and choose from a range of over 30 different teas. Relax in your villa's private Jacuzzi or visit the spa for some rejuvenating treatments. Visit the nearby Galle Fort or spend some time and watch the local birdlife flit across the waters of Koggala lake.